A few more stitches to go and my quilt "Coming Full Circle" will be completed! Today, June 30 exactly one year ago, I left Saigon, Vietnam, uncertain what was going to be next. All the furnishings were packed by the movers, including my Bernina, fabrics, papers, boxes, ribbons, etc. to be put in storage until we knew where our next home was going to be. Spending time in The Hague, we enjoyed being close to our family and friends; the change of seasons - which we had not experienced for so long after living in the tropics; riding our bikes; taking the dogs to the beach and many, many other small things. 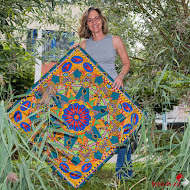 Making new friends with a quilters group in The Hague was really inspiring and this quilt is the result of that. 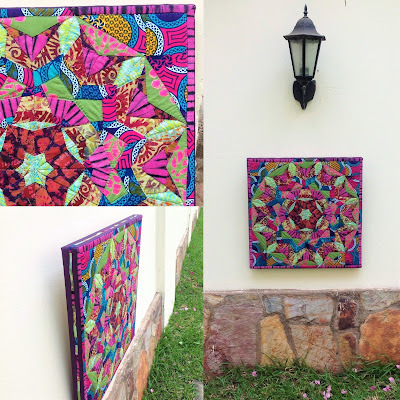 The quilt - 9 panels- is based on a pattern by Wendy Hill in the Magazine Quiltmania, issue 73, and the fabrics were gathered from in and around the city. Well, back to the needle, a few more stitches to go and the binding will be on Coming Full Circle!